Rome (AFP) - Italy has thwarted a mobster plan to assassinate the country's interior minister, arresting six Mafia bosses in the Sicilian town of Corleone, police said Friday. The six are close allies of ruthless Mafia king Salvatore "Toto" Riina, who is currently serving multiple life sentences for murder under Italy's ultra-hard Article 41-bis prison regime, which isolates inmates completely. 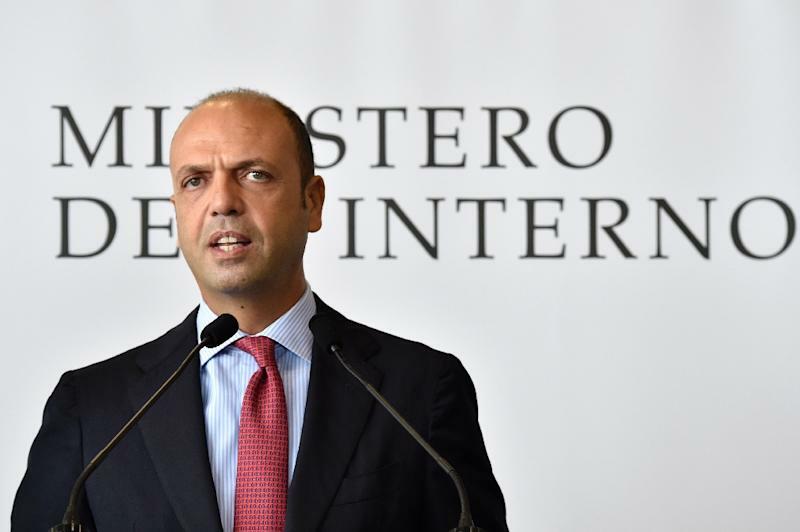 Wiretapped conversations between the six had revealed a plot to murder Interior Minister Angelino Alfano because they blamed him for strengthening Article 41-bis, Palermo prosecutor Francesco Lo Voi said at a press conference. "They made references to a possible attack on Alfano, some of them wanted to do it in Rome and others in Sicily," he said after a series of raids around Palermo with sniffer dogs and a helicopter landed the mobsters in cuffs. "The plan was to attack when Alfano's security was lessened," Lo Voi said, adding that anti-mafia investigators had immediately warned the interior minister and his bodyguards of the danger. The six men were arrested after an investigation, begun in September 2014, revealed not only the assassination bid but also deep divisions within the organised crime group, where Riina's wife Ninetta now calls the shots. The wiretaps were taken a few months ago and the plan initially appeared to have been dropped, but police heard chatter between the men over the past few weeks about hiding firearms, sparking the arrests. "This morning's important operation in Corleone confirms the perils of the Mafia, which only appears subdued and silent," the head of Italy's anti-mafia commission Rosi Bindi said. Justice Minister Andrea Orlando agreed, warning that "the Mafia has been dramatically reduced, but it still represents a danger for security and the country not to be underestimated", expressing the "utmost solidarity with Alfano". The six arrested men lived rural lives on farms in the area of Sicily made famous by the Godfather films and were led by Rosario Lo Bue, 62, who walked miles to secret meetings with accomplices in vineyards in a bid to elude wiretaps. In phone-tapped conversations the gang said they wanted Alfano to meet the same fate as John Fitzgerald Kennedy, the US president assassinated in an open-top car in Dallas, Texas in 1963. They also claimed the Sicilian Mafia was behind his murder. "Who killed Kennedy? Our clan in America. And he (Alfano) did the same thing, he climbed the ladder and then forgot," one of the mobsters says, accusing both men of rising to power with Mafia support then dismissing the crime group. "Angelino Alfano is a pig. Who put him there through friendly votes? He ended up with (former prime minister Silvio) Berlusconi and now they've all forgotten," another can be heard saying. Prosecutor Lo Voi scoffed at the idea that the mobsters "should know anything about Kennedy's death, 52 years after the fact," adding: "There are several fiction films on the subject, I imagine they have seen one of them". The Sicilian Mafia was the country's most powerful organised crime syndicate in the 1980s and 1990s, but has seen its power diminish following years of investigations and mass arrests.